← How Many Wedding Gifts is Enough? It’s weird how you hit your late twenties or early thirties and suddenly everyone is all about Avon or Jamberry or Scentsy or whatever the latest thing is. Now, despite my own personal feelings about multi-level marketing (aka selling a product but also recruiting people to work below you so you get a share of their sales), what you do with your time is your own business. But once you start annoying all your friends, coworkers, and relatives, you are being rude, rude, rude. Don’t bug people, you can maybe reach out to people ONCE to let them know you have starting selling a product. It would be better to just make a general announcement and then people can get in touch with you if they want. Leaving catalogs in the breakroom at work is fine. Pushing your coworkers to host parties or buy product is not okay. Keep your business side separate from your personal side- create a separate Facebook page so people who want to be notified about products can follow it without subjecting your entire friends list to it. Take no for an answer. Many people REALLY do not like the kinds of products that are sold by multi level marketing/direct sales companies. And the tactics that these companies encourage easily alienate people. Ask once, if you must, but be prepared to hear no a lot. If people want to buy stuff from you, they will reach out. 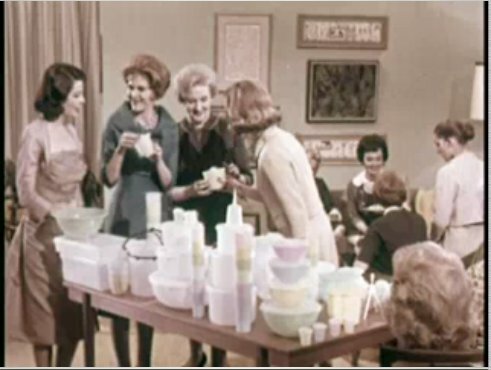 Tupperware parties have a cute vintage ring to them. It’s NOT cute to do a bait and switch. Don’t invite people to a cocktail party and then bust out a surprise salesperson. Make it clear from the beginning. Do provide some snacks and drinks, especially if you receive free items in return for your guests purchases. Don’t pressure people to buy things. Don’t invite people who you wouldn’t have invited to a party that wasn’t about sales. Hearing from someone for the first time in a long time to be invited to hear a sales pitch where the host will receive free product feels like being used. Prepare to hear a lot of nos. Don’t call people out who don’t buy something. Realize that many people don’t perceive these events as true social events or parties, so don’t assume that you are repaying your social obligation for people who have entertained you at “real” parties. After all, you didn’t really invite them for their company. If you want to throw these kinds of parties, you should probably also throw non-sales parties too. You should still RSVP yes or no, but don’t feel at all guilty about saying no. However, don’t be rude about declining- don’t say bad things about the product or salesperson or people who invite people to sales parties. If you get bait and switched, feel free to make your regrets and walk out. Don’t feel obligated to buy anything.